CANBERRA, Australia  A newly-discovered horse fly in Australia was so "bootylicious" with its golden-haired bum, there was only one name worthy of its beauty: Beyonce. 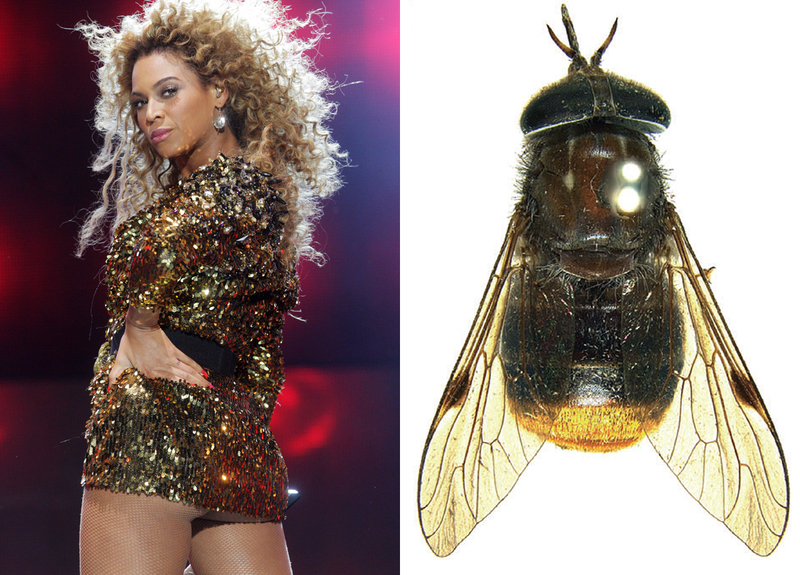 Previously published results from Bryan Lessard, a 24-year-old researcher at Australia's Commonwealth Scientific and Industrial Research Organization, were recently announced on the species that had been sitting in a fly collection since it was captured in 1981  the same year pop diva Beyonce was born. He says he wanted to pay respect to the insect's beauty by naming it Scaptia (Plinthina) beyonceae. Lessard said Beyonce would be "in the nature history books forever" and that the fly now bearing her name is "pretty bootylicious" with its golden backside. "Bootylicious" was the title of a song by Beyonce's previous group, Destiny's Child. It's unknown if the rare species is a bloodsucker like many female horse flies. Lessard says he was unable to find any live specimens when he went looking in 2010 in northeast Queensland's Atherton Tablelands, where it was captured three decades ago. However, at least one member of the public has alerted him that he was recently bitten by what's locally called the "gold bum fly." The description of the fly was earlier published in the Australian Journal of Entomology, but the results were announced last week. Lessard says he hasn't heard from Beyonce, who recently gave birth to her first child, but he is a fan and hopes she will take his scientific gesture as a compliment. He also said the name was picked to help draw attention to the importance of his field and the need for more researchers to catalog and study insects. Horse flies are "vital pollinators of native plants, not just in Australia, but all over the world," Lessard said. "It's extremely important to name all the undescribed species so we can measure our human impact on the environment and hopefully protect it for future generations to enjoy."